I am trying to work out the 'line of sight' between points in a logical matrix, i.e. 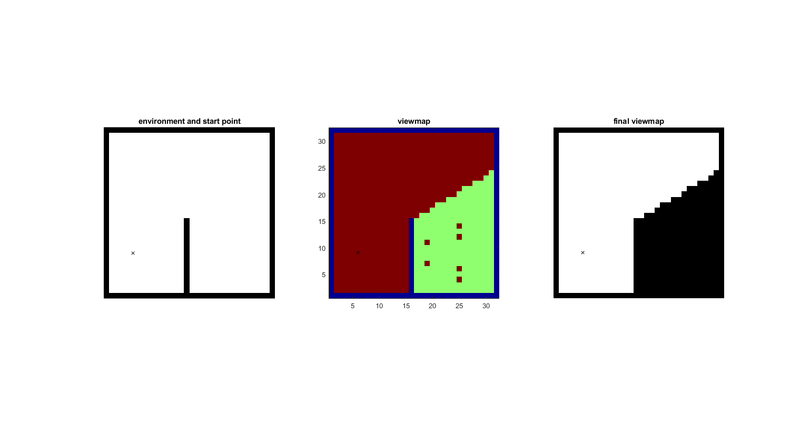 if zeros represent floor space and ones represent walls, I would like to know all the points in the matrix than could be observed from a specific row,column location directly, without the line of sight crossing a wall. I have tried using bwdist and bwdistgeodesic to solve this problem, my first thought was to take the difference between the maps produced using these which would give me a map of all pixels where the euclidean distance and distance traversing around walls are the same (directly visible). Alas this doesn't seem to be the case (see code below). intersect finds, if any, intersect points for 2D vectors, intersect.m attached along with this script. 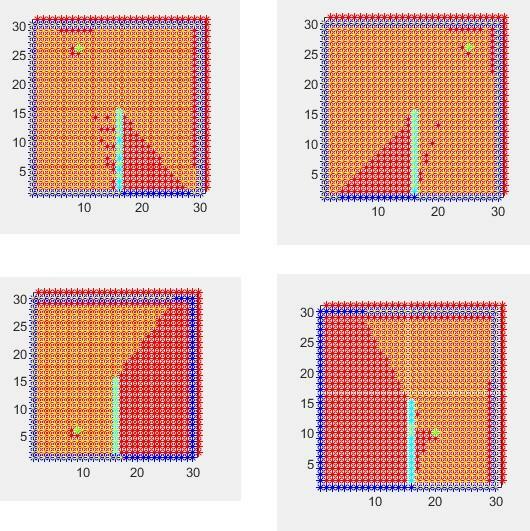 Note that the plot function shows the image reversed compared to the imshow of logical 2D maps that you start with, but the coordinates are all the same. f you find this answer useful would you please be so kind to consider marking my answer as Accepted Answer? Thanks a lot for your help, it is actually quite similar to something I used previously (with help from the Geom2D toolbox), but for speed I'm trying to use matrix operations rather than geometric ones. I have, I think, discovered an easier and hopefully faster approach which I have added as an answer here if you are interested. your code doesn't work for 2 out of 4 quadrants. I have added some new code as a comment to my own answer, mainly I changed the interpolation to nearest and added a tolerance limit for detecting wall crossings (although I don't think the tolerance is necessary if the interpolation is 'nearest'). On testing this seems to work for any point I try now. I didn't know there was a rule about accepting your own answer - very often my questions go unanswered, but if I find a solution I like to come back and add the info for further people... I have unaccepted my answer if you would like to accept it instead. You cannot accept your own answer to someone else's question. You can accept your own answer to your own question. I think I have found a relatively simple solution that should also be quite fast. I use the inbuilt function improfile which was mentioned by image analyst somewhere (I have lost which post it was!) to interpolate out the values between my starting position and any pixel in the map. Next I say that if this interpolated vector contains any zeros (the value assigned to walls) the pixel is given a value representing 'not visible'. This approach results in some missing pixels, I assume this is because the interpolation passes between wall pixels perfectly and the zeros are missed out. To rectify this I use bwareaopen to fill in these 'holes'. the few pixels on the left of the ray for spotter on [25 25] are pixels that shouldn't see but apparently your answer claims to see beyond the cut ray. Is this ok to you? 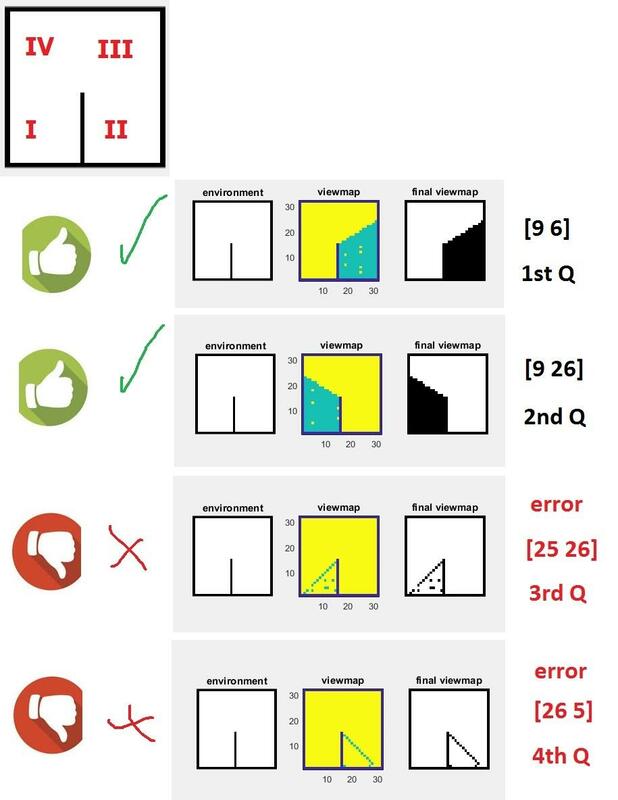 With these simple answers we are supply it's understandable a +-1 pixels error away from the correct pixels, but +-2 pixels away, why is it? 2 pixels too many may be the difference between missing or hitting a pedestrian, don't you agree?